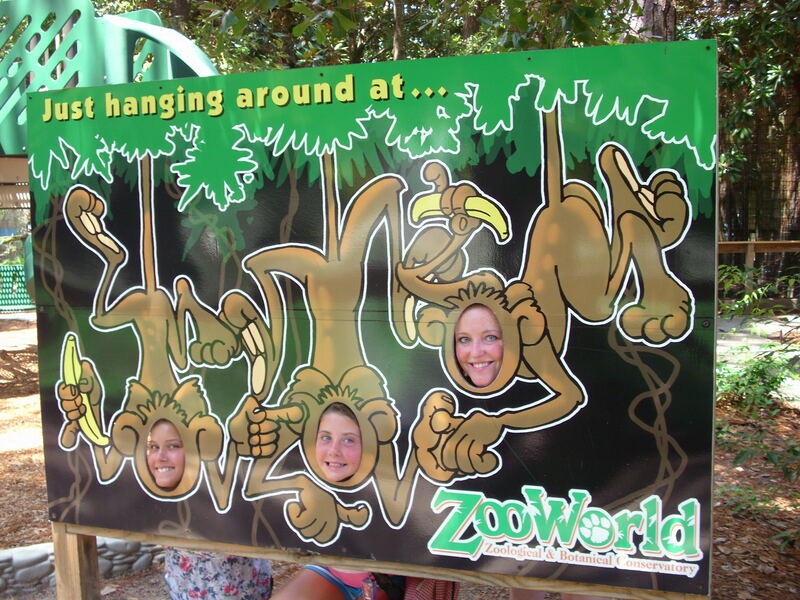 Hanging around at ZooWorld with my cousin and her friend. One experience that has been on my “life list” for as long as I can remember is getting to hold/pet/play with a big cat, preferably a lion or tiger cub (I don’ t know that playing with an adult lion is a good thing to strive for. It’d probably be the last thing I accomplish on my list). When I was in college, I remember seeing a photo of my friend Sam at the Atlanta Zoo holding a baby leopard cub: I was awe-struck and incredibly jealous. At that moment, I realized that maybe my dream of getting to cuddle a baby tiger wasn’t so impossible. Done and done. My mother shares this fascination with wild animals—our home was refuge to a variety of animals when I was growing up, including baby squirrels that had fallen out of their nest. She had already taken me to visit a Wild Cat Sanctuary where I entered the cage with a full-grown lynx (no petting) and a cervil (very limited petting). I was ecstatic that we might actually get to play with baby tigers. We arrived at ZooWorld with the sky darkening and thunder rumbling in the distance. We weren’t worried as the “experience” takes place indoors, but as we arrived, other visitors at the park were asking about the rain policy. We entered the small building where the tigers were being kept, scrubbed up and donned a khaki button-down shirt like the one worn by the staff. This is not only to help protect our clothing, but also gives the tigers a familiar sight. Then we were invited into the tigers’ den, as it were. The cubs were being fed their afternoon bottle when we entered (they were distracted by lunch) and we took a spot by the wall. Tom, one of the keepers at ZooWorld, was conducting the feeding and, after a few minutes, he handled the bottle to me. “Do you want to feed her?” he asked, motioning to Tahar, the female. I took the bottle and in a few seconds…I was feeding a baby tiger. It was incredible. These cubs are snow-white Bengal tigers, a breed of tiger that now only exists in captivity. The value of their pelts is more than $50,000 and they have been hunted to extinction in the wild; there are approximately 55 snow-white Bengals left in the world. Right now, the cubs are a little bigger than my dog, Ferdie (he’s a 25lb Boston Terrier), but when fully grown, Tahar and her brother, Rajastan, will weigh approximately 400lbs and 550lbs, respectively. When the milk lost its appeal, Tom brought out some beef and chicken for the cubs on a plate. My mom and I were allowed to feed them from the plate and then Rajastan took a piece of beef from my palm. His tongue was rough and warm as it ran across my palm. They seemed to enjoy it for a few minutes but soon lost interest. It seems like these two, though usually voracious, weren’t that hungry today. Maybe it was the weather. When we first entered the building, the sky was getting darker but it wasn’t raining. Not ten minutes into the visit, though, the bottom opened up and it started pouring. This was fantastic for us: due to the rain, we didn’t have any zoo guests standing at the window, watching our every move (which is pretty distracting—now I know how the animals feel). And…Tahar had never seen rain before. During our visit, she was finally tall enough to stretch up on her back paws and peer out the window to investigate the strange noises and the odd look of the rain sliding down the glass. She was fascinated. Several times through the visit she would stalk to the window and just stare at the water coursing down the window. It was humbling to see her learning. The time went way too quickly—Tom had exited from the cube after about five minutes, remarking, “you ladies look like you have it under control” so we had the cubs to ourselves. We dangled stuffed animals, shook a paper towel roll (a favorite toy), stroked and just generally hung out with the cubs. Rajastan spent the bulk of the time napping, occasionally rolling over to have his belly stroked. Tahar was more inquisitive and playful, alternating between watching the rain and figuring out our purpose. Before we knew it, 45 minutes had elapsed. We reluctantly exited the play area and returned our stylish khaki shirts. I couldn’t stop grinning. That rainy day was one of discovery for both Tahar and me. I had the chance to see a wild, exotic animal learning about something that had become commonplace for me. Seeing her wonder and curiosity reminded me that there is wonder in everyday events, if only you’re open to seeing them. Tags: list, Panama City, tigers, ZooWorld. Bookmark the permalink. Oh! that was so much fun! Your description brings back many details I had forgotten. It so humbling to be in the presence of majesty.